Your sidewalks and patios are cracking and pulling apart. Mold appears on the interior walls of your home. An unstable slope, crashed fences, patios buried in mud. What do you do now? 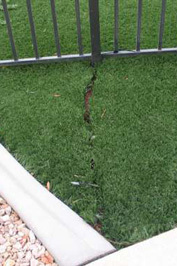 American Geotechnical will find the cause of and offer effective solutions for the problems with your property. We are knowledgeable in all areas of earth-related construction defects. Our licensed engineering and geologic teams will provide a detailed investigation and easy-to-understand reports, and we won't stop there. We will recommend treatment and guide you in your selection of qualified, capable contractor. American Geotechnical will stay the course until your property is restored to a condition better than the original. Subsequent ground water characterization studies are performed when required to further determine soil and hydraulic characteristics of aquifer materials, definition of on-site and off-site soil, ground water contamination plumes, including remedial feasibility studies. Cracking is typically noticed within the structure's brittle surfaces such as plaster, stucco, masonry and concrete? Ceramic tile cracks are usually objectionable at any width? A random crack pattern in the clay soil is indicative of expansive behavior? In open foundation cracks, the presence or absence of salts within the cracks can provide useful clues as to the relative age or causation of the cracks? American Geotechnical understand that it is difficult to determine the significance of soil-related issues. Our educational FAQs has been designed to help you better understand soil influence. Devastating landslides, disastrous earthquakes, wildfires and drenching El Niño rainstorms merge together, making California the most geologically-active state in the country. No matter where you live in California, it's likely you've encountered one or more of these natural disasters. When disasters happen, our team of professionals will be at your side, making tough decisions needed to protect you, your home and your family. In 1996, when the San Diego sea cliffs collapsed, we were at the site within twenty minutes. 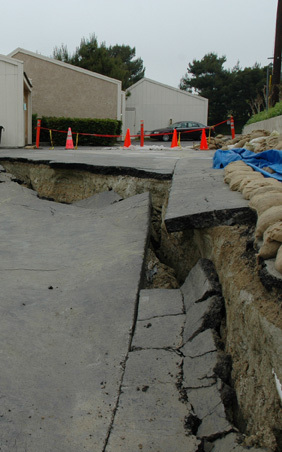 We have handled more than 1000 earthquake damage investigations from quakes dating as far back as 1971, as well as hundreds of damage investigations from the 1994 Northridge earthquake. 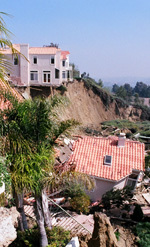 In 1998, our team headed up the investigation of the internationally recognized Laguna Niguel landslide. We accurately defined landslide limits and timing episodes of failure with the aid of sophisticated monitoring equipment, around-the-clock hard work, and the ability to make tough decisions. We directed the evacuation of at-risk properties while comforting and reassuring homeowners at the edge of the Red Zone. American Geotechnical possesses the necessary experience, skills, technology, and professional concern to respond to almost any natural event. The earthquake is over, the landslide stopped, and/or your claim has been settled. American Geotechnical can now evaluate the conditions and resources available to you, recommending and implementing the course of action that will best restore your site. We have long associations with contractors, which aids in the repair process. Our projects have ranged from repair of a single family residence foundation to a multi-million dollar hillside stabilization. Superior technology lets us "watch the ground move"
When are soils engineering and engineering geology reports required? These reports are required when soils or geologic concerns affect a site's development. Typical conditions that require geology reports are areas of high relief and bluff areas where landslides, faults, mudflows, erosion, etc., affect a proposed development. Certain geologic hazard areas (including flood zones and fault zones) are shown on maps maintained by the Planning Department and are available for review at the Zoning Counter. However, in most cases the determination as to whether an Engineering Geology or Soils Engineering Report is required is based on a field inspection of the actual development site by County staff. In most cases, this determination is made through the Geologic Hazards Assessment (GHA) process (see separate pamphlet on Geologic Hazards Assessments). Where the GHA identifies potential geologic hazards that require in-depth investigation, an Engineering Geology Report is required. Soils Engineering Reports are required to help mitigate geologic concerns, soil constraints such as expansive soils and areas of soil collapse, or when special foundations (such as pier and grade beam) are needed to compensate for the site's relief or geologic constraints. They are also needed when significant grading will occur. Both soils and geology reports are becoming more common as larger houses are being built on steeper terrain. Applicants who wish to know as early as possible whether geology reports will be required can apply for a GHA prior to submitting their development plans. Information from the GHA and/or engineers reports can be utilized in the design of the project, thus providing for a quicker review of the actual development application.